This mural features the Northern lights viewed from a pine forest and was done by the artist Smoky whose work I have shown many times. The building on Bloor St W belongs to the Christie Ossington Neighbourhood Centre which offers essential services for vulnerable community members and houses a fully accessible shelter for 30 men as well as their Loft Kitchen which serves food and trains youth at the same time. A very beautiful mural depicting one of nature's wonders. I saw the northern lights once when I was a little kid. It was a rare occasion when they were seen as far south as Illinois where I lived. I guess that today you have to be pretty far north to get a good look. However, if you search "Northern lights" on Flickr, you will see all kinds of spectacular photos. P.S. How did that maple glazed salmon turn out. You inspired me to purchase a slice of salmon and I'm going to try the same thing tonight. Fabulous! I haven't seen this one. It's absolutely gorgeous! I love the colors. Oh this is fab Pat, how incroyable it would be to see the Northern Lights, an unforgettable experience. I like the mural and love what the building is used for, everyone needs a bit of help at some time in their lives. What a beautiful mural. I would love to see the actual Northern Lights. It is on my bucket list. Happy Monday, enjoy your day and new week! Wow...that looks exactly like the northern lights. What superb artistry! And I'm delighted to hear that the building is being used to help people square away their lives or just get by from one day to the next. I think most of us cannot ever feel the despair of not knowing where the next meal is coming from or where we're going to sleep at night. Beautiful noteren lights indeed. Remarkable catched. Bravo to the artist that captured the northern lights experience, a wonderful job! This is so well done! Love the northern lights! And a beacon of hope in this area! That's nice - and the building sounds a really positive place too. Now all it needs is the real northern lights reflecting off the building. This mural is so different. It is beautiful. Awesome, it's so beautiful, Pat! Very cool, RedPat. I am going to take a cruise this summer up the Norwegian coast to the Arctic. I hope to see (and photograph) the Northern lights. So cool. The Northern Lights have been on my bucket list since I was a kid. But I hate being cold. And there in lies the rub. Thanks for contributing to this week's Monday Mural. Oh wow! 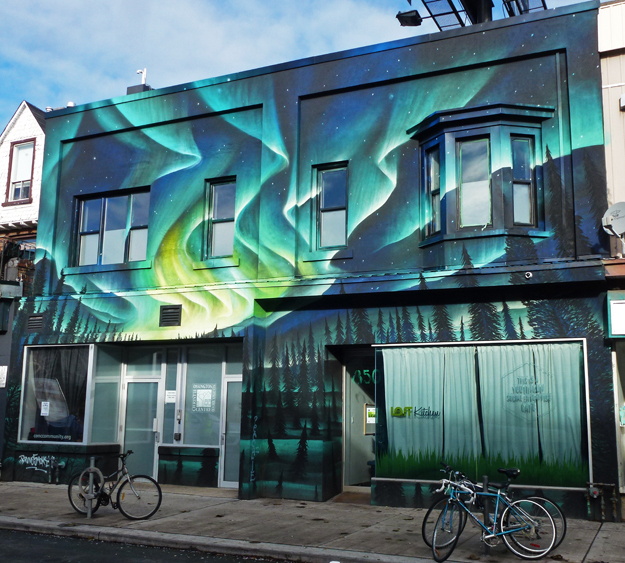 Northern lights on a building. What a great idea. What a wonderful mural. Love the colors and patterns. I want to see the Northern Lights in person some day. I misread your blog title as Occassional Tornado! I wasn't sure what to expect. Love this mural! The Northern Lights have always fascinated me.